KAD’s Non Return Dampers are designed for automatic shutoff of Individual sections of the air conditioning system. With the fan running, the degree of blade opening is a function of the air velocity. If the fan is turned off, the blade closes automatically. In multi fan installation system this prevents back draught through the non operating fan. KAD “NRD” type model also named as “SELF CLOSING DAMPER” or “GRAVITY DAMPER” or “PRESSURE RELIF DAMPER”. 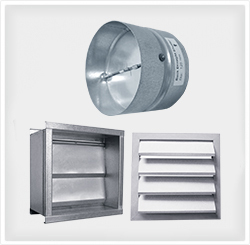 These are air operated, opening or closing dampers for intake, discharge and pressure relief vents in air conditioning systems. Designed to maintain a constant air pressure level inside pressurized rooms. Frame is manufactured from high quality aluminum / Galvanized sheet steel of 18 gauge thickness. Blades are made of 0.3 mm / 1.00 mm thickness aluminum sheet or galvanized steel sheet. Blades are fitted with nylon bushes for rattle free and smooth operation. Blades are sealed with foam / rubber gasket at the bottom to avoid rattling noise and provide air tight operation. Frame is fitted with aluminum strip to prevent the over movement of the blades. Additional centre partition shall be provided if height or Length is more than 900 mm.